Have I ever told you that I wasn´t born in Hamburg? The locals normally say that it takes at least two generations until you can call yourself a real citizen of the city. Despite not fulfilling this criterion, I´m proud to call Hamburg my hometown. If you are from here, it seems that some garments are necessary to complete your wardrobe. One of my favorite brands is ‘A Fish named Fred‘. After receiving the current lookbook there is this one piece, that attracts my attention immediately. 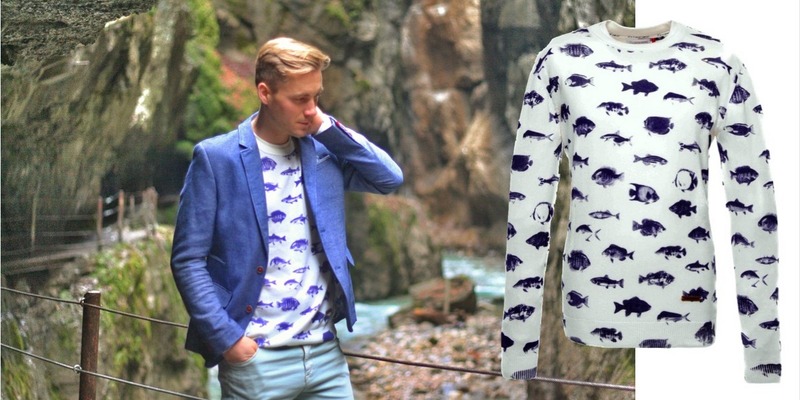 It´s a sweater with retro fish print, which gives me that ‘have-to-have feeling’. It´s exactly that kind of piece, a guy from Hamburg should have. When I decided to go on a trip into the Alps not long ago, I’ve been looking for an outfit that creates a contrast to the mountains. It took me a while until I remembered that sweater to be a great piece for shooting. Even though I ordered it pretty late before leaving Hamburg, I got the long-desired package on time. To be sure to have the right outfit, I decided to show the sweater to some of my friends. All of them fell in love with it immediately and convinced me to wear this It-Piece. That’s the reason, why I would love to show it to you today in detail. The associated outfit will go online within the next weeks and I can’t wait to show you the result. And my favorite movie is “A Fish Called Wanda”. Coincidence? You decide. So where were you born? And can you please ask Angela to invade the United States?